Lukewarm is what you get when you mix hot with cold. It’s mixing the white-hot love of God with the stone-cold commands of the Bible. It’s mixing the new and everlasting covenant of grace with the obsolete covenant of law. The law is meant to lead you to Jesus so that you may be justified by faith (Gal 3:24). If you have Jesus, you don’t need the law. You don’t need it to guide you, teach you, or show you how to live for you have a far better teacher in the Holy Spirit. Jesus said the Spirit would teach you all things (John 14:26), leaving nothing for you to learn from the law. You died to the law so that you might belong to another (Rom 7:4). As Paul says in Romans 7, running back to your old husband the law is cheating on Jesus. It’s spiritual adultery that will leave you lukewarm and fallen from grace. An old covenant mindset is sin-focused, but the new covenant is Son-focused. Under the old you had to run from sin, resist sin, pay for sin, turn from sin, confess sin, and keep track of sin. But on the cross Jesus did away with all sin (1 John 2:2). Because of Christ, sin is no longer the problem. “But I can’t get rid of this sin.” A lukewarm believer will never have lasting victory over sin because they are trying to accomplish that which Christ has done. They’re operating in unbelief and walking in the puny power of the flesh. Are you struggling with sin? Fix your eyes on Jesus who offers you his righteousness and who empowers you to go and sin no more. Don’t say no to sin; say yes to Jesus! The old covenant was characterized by repeated sacrifices that did nothing to take away sin. The new covenant is characterized by Christ’s perfect sacrifice that did away with sin once and for all (Heb 9:26). An old covenant mindset says I must deny my God-given appetites, be who I’m not and die daily, but the new covenant declares Jesus died for all. The lukewarm believer says, “I’m saved by grace but sanctified through the pursuit of holiness. I’m positionally holy and progressively sanctified.” Yet the Bible says you were sanctified and are holy (1 Cor 6:11, Heb 10:14). You’re as holy as Jesus. Under the old you had to take steps to get holy, but in the new there’s only one step and it’s Jesus. He is our holiness from God (1 Cor 1:30). You are the holy temple of the Holy Spirit (1 Cor 6:19). Holiness is not something to pursue but to work out. Scripture exhorts us to “be holy” meaning be the holy saint you already are. Live out of your true identity in Christ instead of a false, half-holy-and-trying-to-get-holy caricature invented by man. “Lord I promise I’ll never do that again.” How do you know you won’t? Why are you bragging to God about your abilities? Let him who boasts boast in the Lord. The old covenant began with the Israelites making promises to God (Ex 19:8) and they broke every one. In contrast, the new covenant is built on the better promises of God to you (Heb 8:6) and he will never break his word. Stop thinking about yourself. Stop listening to messages that focus on you and your shortcomings, and fix your eyes on Jesus and his sublime perfections. We are not changed by fault-finding and navel-gazing. We are transformed by beholding Jesus. “I’m just a humble doorkeeper serving in the courts of the Lord.” Except you’re not. You are dearly beloved child of your Father. Why settle for old covenant servanthood when you’ve been offered new covenant intimacy? Don’t distance yourself from the Lord. Listen to Jesus who came to reveal a God who loves us like a Father. A lukewarm Christian has a muddled identity. When he sins he comes crawling back with a “make me one of your hired hands” speech (Lk 15:19). Your Father is not interested that speech! He wants sons, not servants. We’ve looked at seven symptoms of a lukewarm life and there are many more. But the cure for lukewarmness is simple; stop mixing hot and cold. Turn off one of the taps! If you are trusting in your own righteousness, bathe yourself in the cold-harsh law that Jesus preached. Open that cold tap all the way and it will drown your futile attempts to live right. The cold law reveal your desperate need for God’s grace. If you prefer grace – which is the better choice – stop mixing covenants. Turn off that law tap and never touch it again. Stop listening to muddled messages from muddled preachers that muddle grace with law. Instead of paddling in the muddied pools of mixture, start swimming in the vast ocean of your Father’s love. Make “Christ alone” your unmixed doctrine and grow in the grace and knowledge of Jesus. Allow the Holy Spirit to reveal your Christ-given identity. Tell yourself every day, “I am the righteousness of God in Christ Jesus. I am my Father’s beloved child.” Abide in his love and you will no longer be tossed and turned by every muddled and mixed-up teaching. Wow what a wonderful message. Thats a different insight of the revealtion chapter 3 vs 16 bless you .. I look forward to your articles! As a retired school teacher, I love how you present your thoughts in such a concise, orderly fashion, making it easy for the reader to understand such great truth! Thank you! Thanks Dorothy. As a retired university teacher who aspires to be clear, I’m delighted to hear your feedback. Thanks for taking the time to write. I love most of what you say, but I guess I am lukewarm. I read all your books but it seems to me that you promote lethargy and complacency. Please correct me where I am in error. Yes I see myself as God’s servant and cannot see the benefit of seeing myself otherwise. Yes I try to live a life pleasing to the Lord and Solomon is our example of what happens when we don’t restrain our passions. Hi Mark. It is good to be servant-hearted as Christ is, and to serve in Christ’s name, as Paul did. But here I’m speaking of identity, not service. To identify yourself as one who serves the Almighty is the height of hubris. Jesus came to reveal our heavenly Father, not our heavenly boss, and Paul understood this better than anymore. More here and here. Wow wow wow! This says so clearly what I want to shout to every defeated Christian that crosses my path. It’s what makes the gospel “good news”! This message alone gives us peace that never leaves! And though some say this message promotes lethargy, it actually has the opposite effect. Because, the strength of the law is sin, so using the law to avoid it, will only strengthen it! Such beautiful irony. Beautiful words, Paul. I’m proud to say I can check an F on every one of those test questions! I’m boasting in Jesus and His work, not mine! Thanks for making the message of the good news so straightforward and showing trying to keep the law through self-effort for what it is, filthy rags. I recommend all of them, haha! But start with The Gospel in Ten Words as it is the one that speaks directly to the believer’s identity in Christ. Greetings Stephen, I have felt the same way and experienced the same struggle, but all God wants from us is to trust Him to produce His life in us. If we are lacking in any area, the answer is to trust Him. This is abiding in the Vine. The branch receives life by abiding in the Vine. Our heavenly Father doesn’t look at us with disappointment for not measuring up. He wants us to receive what has already been provided for us through the completed work of Jesus. Abide in His love and allow His life to do its’ work in you. Our efforts can never produce God’s life, so take the pressure off of yourself and trust Him. thanks, great list, all true! unfortunately, such articles are only understood and loved by people, who’re already on a grace/jesus centered path. every law oriented christian (” “) will immediately quote you 100 NT verses after reading this, which supposedly prove their law-obiding version(s) of the gospel. with other words: i would love to find a text, where those, last mentioned verses were adressed. @werth The scripture index in the archives may help. Thank you Paul for your faithfulness you know I think sometimes many of us struggle thinking that Gods grace seems almost to good to be true ….. Reading this made my heart burst ☺ with joy. God bless you. Sorry Paul, I think your arguments here don’t do justice to the roles of the law and of holiness? For example, when I seel to actively fulfill the first 2 great commandments plus Jesus’ commandment to follow His example of brotherly love, then how can one be acting contrary to the Spirit? The apostle Paul, said the law ‘is good, righteous and holy’. Holiness exists positionally in Christ but is also something to be pursued ‘be Holy, for I am holy’. Jesus said “if you love Me then keep my commandments”. Obedience is the out working of holiness. Yes, the law is good, but it has no power to make you good. Paul said the law is not for the righteous but the lawless, rebellious, the ungodly and sinners (1 Tim 1:9). We are not under law, but grace. It’s one or other, not a lukewarm mixture of both. You can’t have two spouses and living under law is cheating on Jesus (Rom 7). Why are we exhorted to be holy? Because in Christ you are 100% holy. Be who you are. Positional holiness is an extra-biblical and blasphemous phrase invented by those Martin Luther called law-drivers. I appreciate this is a lot to take in and I don’t mean to offend. But understand that trying to keep the law, for whatever noble reason, is a sure sign that one is not established in Christ’s righteousness. Another way to look at the question is this way. Our enemy goes around impersonating an angry God in a bid to cause us to feel unloved and unacceptable. Thankyou for shedding light on the true meaning of what it means to live a “Luke warm” life. I like the scripture, 2tim2:15, which instructs us to “study to show ourselves approved”. APPROVED. . . not unapproved or unacceptable or disqualified but much loved and accepted as sons. Praise my Daddy God. Thanks Paul. Your dualistic argument doesn’t work. “Love is the fulfillment of the law”. 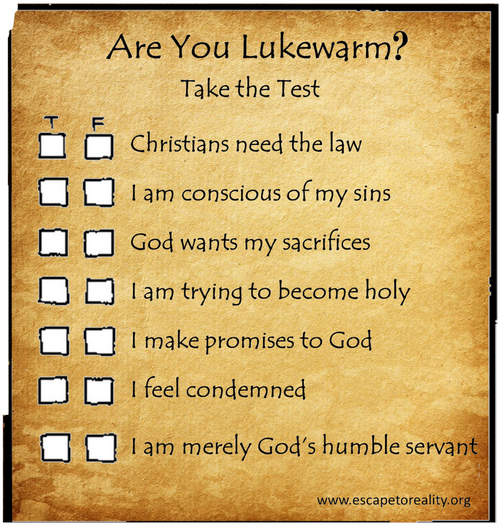 If the law is anti – Christ (which is what you are inferring) then why did Jesus give us a new commandment- was He being lukewarm on that day? (Rhetorical). You cannot willfully break God’s commandments and claim to be His follower at the same time. The Word is unequivocal. Liars, adulterers and murderers “will not inherit the kingdom of God”. Choosing to live a morally righteous life is a fruit of discipleship not a barrier to. The law is not anti-Christ, for the law was put in charge to lead us to Christ (Gal 3:24). The law is a signpost to Jesus who fulfilled all the righteous requirements of the law so that we might be justified by faith in him. I don’t know any Spirit-filled believer who seeks to sin, but sin-consciousness is most certainly a fruit of living under law (see Romans 7). “Choosing to live a morally righteous life” smacks of works righteousness. It’s the mantra of every religion ever invented. Why not choose to walk after the Spirit? Why not abide in the Vine and allow him bear his fruit in you? Thanks for another awesome read Paul, and I marvel at the fruit of the Holy Spirit, through You, in patience. As you do humbly contend with those who still look through a veil. Although a believer’s righteousness is in Christ, “Blessed are those who hunger and thirst for righteousness (holiness, obedience, desiring to please God etc. ), for they shall be filled.” We surely will not fully succeed while in these mortal bodies, but the desire (“the hunger”) to do so is the Holy Spirit driven empowerment that will accompany a true, maturing Christian experience. In what sense do we not succeed/fail? We succeed/fail in the sense that we are able to quench the Spirit. In the sense that “the whole creation groans and travails in pain…even as we ourselves groan within ourselves,waiting for the…(final) redemption of our body” (Rm.8:22+23). In the sense that if we are among the “elect”, it is possible that our final redemption will be as “by fire”- by the skin of our teeth so to speak. I’m sure I could give many more scriptural examples given the time. We have free will within the context of our salvation, do we not? Are we not counciled to rid ourselves of the “wood, hay and stubble”…if we want to be “meet for the Master”s use? We have a role to play in the ongoing sanctification process and God in His Wisdom designed that removal of our condemnation and the resulting freedom is the way to love in all it’s aspects and victory over sin and death and the devil. Granted that we cannot earn our salvation but do you not agree that their are choices we make that demonstrate our priorities and hinder or foster our growth?….”Seek ye first…” I’m not a regular reader of your postings and I don’t see these issues as “salvation” ones but I just get the impression that there is little acknowledging of human responsibility in walking the “narrow” way after entering by the “straight gate”. If Jesus never changes Heb 8:4, and He is the only way to the father, He has always been that way to the father. Is Jesus not the Word of God? Did Jesus not say what Moses wrote was the Word of God? Mark 7:13. He calls the Word of God what Moses wrote. So when He says they nullify the Word of God by their tradtion, they Nullify Him. Jesus is the law, he is the Word of God. He has always been the Only way to God. At Mt. Sinia they agreed to do the law. The result was, I will be your God, you shall be my people. The Law or Word, or Jesus, was their way to God. Jesus the messiah is still our only way today. Later in our studies we realize who the Angel In the Wilderness was, and what the law actually is! There is one theme in all of scripture. Lawlessness, or without Jesus. There is no separation between the law and Jesus. Please excuse my lengthy response. The descendants of Abraham were God’s people long before the law came along. God made a grace-based covenant with Abraham, but the Israelites preferred the sticks and carrots of the law. It was a terrible trade, the worst trade in history. And they broke it the same day they got it. The overwhelming theme of history is that no one can keep God’s perfect standard. All fall short (Rom 3:23). The Bible refers to the law-keeping covenant as obsolete or inferior. Thank God for Jesus who redeemed us from the curse of the law that we might be justified by faith in him (Gal 2:16, 3:13). You can trust in your law-keeping performance or you can trust in his. Noah knew the law before it was given at Sinia. He was commanded to take clean and unclean animals into the ark. Able offered up his firstfruits to God while Cain did not. There is a reason for this in the scriptures. And I most certainly can not rely on anything I do to get to the Kingdom. Salvation is only found in His long-suffering, mercy, and grace. Yes I walk Torah in my life, not to be saved, but because I believe it to be eternal truth and righteous instruction. It is my believing this, that causes me to do it. Paul you have always responded to me in love and with respect on here. I wanted to thank you from the other side of the world for this. The attempt to explain the meaning of scripture by merely interpreting the written word fails in comparison to the experience of the fullness of the WORD. “that became flesh” and is in US by the same Spirit. Paul said in Romans 7 The struggle to do what he wishes but cannot etc references his wretched life of his “old man” expression. However he does not end with the dilemma as Roman 8 references: those LED OF HOLY SPIRIT these are the sons of God. Sons are overcomers where this is no thoughts that cannot be taken captive unto obedience in Christ’s mind dwelling within, revealing it’self unto the fullness of His stature. If sin, the devil, and poor choices are the reason for hardship, than God is not in control. What about the flood, the martyrdom of the apostles, Hebrews 11? Gods will is not always healing, prosperity, and comfort. Sometimes He requires suffering and even death. The purpose of God and the Holy Spirit is to glorify Jesus…..whether in victory or apparent defeat. God is good and more concerned about our erternity than our comfort. Thanks I learned alot… The massage came just at the right time when I need it. May you be blessed. Awsome message. I am so blessed. thank you for this wonderful post. stay blessed! I sometimes feel and instinct to act according to grace, sometimes I hit sometimes I miss. See what I did there I made it about me. I’m going to shift my gaze to his sublime perfections because He is our secure anchor. Paul, thank you for this article! It is a wonderful help to understand this truth. If I want to be honest, I still struggle with my lukewarmness. My heart completely embraces the grace I have been given, but my mind is another story. Sometimes we do think it is too good to be true. I guess it’s human nature and just how the system of this world taught us to think – “nothing is free”. Praise God we are not of this world even though we are in it, we are sons and daughters of the living God and we are seated in the heavenlies with Him. 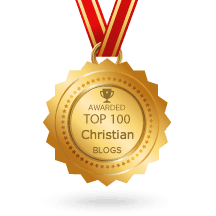 It is so wonderful, that sometimes I have a real hard time wrapping my head around it and I am sure a lot of lukewarm Christians do too. This is when we tend to run back to the law, it’s like wanting to run back to Egypt, back to suffering and the works of the flesh. Trusting Jesus is the key, the only way we can be free. The Spirit of Truth leads us and your articles are great tools He uses in my life. God bless! Thanks for the feedback. I totally understand what you are experiencing. My mind always wants to figure things out and take charge, but that is the way of the flesh. Far better to be led by the Spirit which for me means distrusting myself and trusting what God has said and is saying to me now. Many, many times my spirit has received revelation with joy while my mind has doubted. Only later, when I have seen it in the Bible does my mind catch-up to what my spirit already grasped. I like to think of the Spirit as the locomotive and my mind as the caboose. I had a VISION of LUKEWARM is as in Psalm 82:5 “You do not know, nor do you understand; / You go about in darkness; / All the foundations of the earth are shaken. 6 I said, You are gods, / And all of you are sons of the Most High. but you will die like men. . .” Lord showed me Hot and cold are buckets of water on a fulcrum as a teeter totter. LEVEL: BALANCING life experience in the world as OLD man, with KINGdom life as NEW man experience. A religious mind is lukewarm, trying to balance world with KINGdom. The TEST is when the foundation/fulcrum is shaken and the buckets fall and run/spill into each other. Is my experience to SOLVE MY PROBLEMS with my own underSTANDING or have faith/trust in KINGdom EXPERIENCE? So stinkin’ awesome! Thank You Paul! I am thrilled to have found this site. Great articles and…. what a blessing! Hi Paul, I have recently given my life to Christ (1.5yr ago) and He has changed my life totally away from sin by convicting me of things that were negatively affecting my life. But as I was reading the Bible I was convinced that we should aim to be holy. So I became conscious of sin in my life and tried to repent from every sin. Is that wrong? I’m a bit confused after reading your article. Some of the questions here I had answered “True” (specifically, #1, 2 and 4). I thought the Law is used to show us (Christians and else) what sin is. I understand that the Holy Spirit will convict us, but if we are confused in certain things, shouldn’t we go back to his Word to confirm the conviction? I don’t believe Christians are *under* the law, but we can use it as the example I just mentioned. Is that wrong? Could you help me? What articles should I read? I don’t mean to offend when I say this, but “trying to repent from every sin” is a classic example of a dead work. It’s a futile endeavor (can you be sure you got everyone? ), and it won’t make you holy. The law does indeed show us what sin is; it also shows us how to deal with that sin by pointing us to Jesus (Gal 3:24). Jesus became sin so that in him we might become the righteousness of God. Every minute you spend looking at yourself and your sin is a minute you could’ve spent beholding Jesus and his perfection. Every minute you spend trying to make yourself clean or holy is a minute spent in unbelief. I know this is a lot to take in, so I encourage you to click the links in the article above for more. Be blessed! Thank you Paul for the reply. I’ll be reading what you have to say and be praying. One question I have, do you believe a saved person can lose his salvation (aka once saved, always saved)? I have written extensively on the eternal security of the believer. You can find relevant articles in the Archives>Subject Index. Thanks. Paul , I call this freedom teaching ! Love this ! We need this teaching to help us Grow in Grace! How can we grow without real food ! It is His gold that has been refined in fire that He is offering, not commanding. So, what do we pay with? What we have control of is; time, attention and our will. We miss that Jesus’ polite offer following this; “Behold I stand at the door and knock” is an offer made to the lukewarm church! There is no condemnation here, just invitation. The invitation to “koinonia” is first with a living, present, resurrected Jesus! We are the ones who seem fixated on commandment, Jesus wants “koinonia “! You may be interested in the other articles in the Laodicean series where these verses are discussed. Yet another liberating refreshing word. Many thanks Paul for feeding us great spiritual truths. More Holy Spirit!